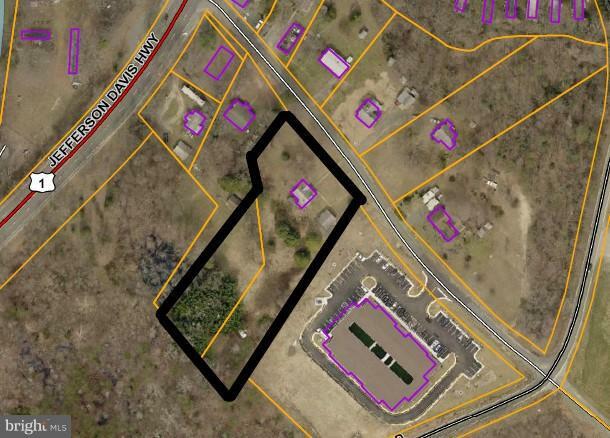 TWO PARCELS TOTALING 1.84 ACRES IN COMMERCIAL CORRIDOR JUST OFF & VISIBLE FROM US RT 1 HWY. CURRENTLY ZONED RESIDENTIAL BUT ADJACENT TO HOTEL AND OTHER COMMERCIAL. HOUSE AND GARAGE TO CONVEY "AS IS", VALUE IN THE LAND AND LOCATION. CLOSE TO QUANTICO MCB AND QUANTICO CORPORATE CENTER. Listing courtesy of Aquia Realty, Inc.